It is the little things that make the biggest difference. Many of you know I have a daughter that plays soccer. This Sunday was our last week of fall season play and we had two games. 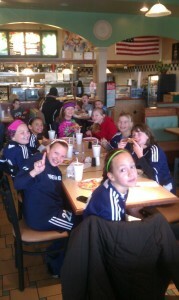 Between the games we treated the girls to an impromptu pizza party at a pizza shop near one of our games. I had eaten there before and recommended Fortunato Brothers in Edgewood, MD. The team and parents took over 1/2 the restaurants seats. We ordered and ate. Everything was excellent. Service was good and a walk to the bathroom allowed a peak into the kitchen area. My quick “inspection” was good! As we were leaving the gentleman behind the counter, I am presuming the owner or manager, calls to me and hands me two take out boxes. Hmm, I didn’t order anything to go…a peak inside and oh yum he made the girls what I would call fried dough. Hot and covered in sugar. It took all I had to not devour them before I had time to give to the girls. Such a small gesture had the entire team talking about how nice a place it was and how good the food was. So if you are ever in Edgewood, MD and want to have some wonderful Italian food give Fortunato Brothers a visit! And notice the American Flag over the counter!